After 20 years in the Air Force, Maurice Hill looked forward to transitioning to a civilian career. Settling in Warner Robins with his wife, Twila, who works in finance at Robins Air Force Base, Hill enrolled at Middle Georgia State University to get a bachelor's degree in Information Technology. He already had quite a bit of experience in the field, taking on multiple IT-related tasks in the Air Force, including teaching, working at help desks and managing administrative teams. When the Pentagon wanted to restructure titles and duties in certain IT fields, Hill was among the service personnel that officials asked to make suggestions due to his extensive knowledge. As he hit the home stretch in his Middle Georgia State studies, Hill attempted to summarize his experience in a resume. Not all of his Air Force IT work was reflected in his official job duties, which is challenging to succinctly explain. He ended up with a bloated document full of Air Force lingo unfamiliar to many civilians. Enter Dr. Melinda Robinson-Moffett, Middle Georgia State's director of Career Services. She worked with Hill to help him inventory his skills - playing up his leadership and management abilities - and "de-militarize" and condense his resume. "I was mind-blown at how good my resume looked after she helped me," said Hill, 42. "The civilian workforce is an arena I haven't been to before, but now I have confidence moving forward in my job search." Those words are gold to Robinson-Moffett, hired in 2015 to turn Middle Georgia State's Career Services office from an admittedly underused resource to an essential service for every student - and alumni. For Robinson-Moffett, that can mean gently advising a young student who says he plans to enter the medical field but hates science and math. Or helping a non-traditional-age business major, nearly overwhelmed with school and family responsibilities, understand the importance of creatively carving out time for an internship – or at least part-time or volunteer work related to her career goals. The 39-year-old Lizella native’s own career threads through educational institutions, from grant writing for Bibb County schools through program directing at Fort Valley State University to teaching Upward Bound and TRIO participants at Mercer University. In the latter programs, which provide educational support to students from low-income families, Robinson-Moffett saw a disquieting pattern. Many Middle Georgia State students fit the mold as the firsts in their families to go to college. Others are like Hill – non-traditional students uncertain how to transition to new careers. But the reality is, students from all walks of life can be astonishingly naïve about effective ways of job searching and career development. “Going up to an employer at a career fair and asking, ‘Whatcha got for me?’ is not good strategy,” Robinson-Moffett said, describing a scene she witnessed herself. Accordingly, she had a big to-do list waiting for her when she arrived at Middle Georgia State from her most recent job at Mercer University, assistant director of Career Services. Among other things, she contacted numerous public- and private-sector employers in the area to identify internship and job opportunities for students. She began building relationships with other University departments, all of which recognize the need for higher-profile career services but might not know how to help raise awareness among students. In a short time, Robinson-Moffett and her staff organized four career fairs on the Cochran and Macon campuses, with more to come. They’ve hosted at least one career development activity (‘Resume Review Day,’ ‘Lunch n’ Learn,’ ‘Dining Etiquette’) on all five campuses each month. They’ve recruited real employers to conduct mock interviews with students to help them practice their skills. The Cochran Campus lacked a dedicated office for Career Services, so Robinson-Moffett established one in Sanford Hall and keeps set hours there. Twitter, Facebook, LinkedIn? Career Services is all over them. The mileage on Robinson-Moffett’s 2011 535i is piling up with her constant commutes between Middle Georgia State’s campuses in Macon, Cochran, Dublin, Eastman and Warner Robins. She’s straightened shirt collars of students walking into career fairs. She’s offered tissues to dry tears. She’s given reality checks. Twelve-hour workdays are routine but Robinson-Moffett seems able to maintain the pace and radiate optimism. She credits an increase in her prayer life. Which is apt, because her work is akin to being a missionary. Her wish list includes hiring coordinators to provide full-time career services on each of the University’s five campus. She also hopes to work directly with more alumni, many of whom likely don’t realize that services remain available to them after they graduate. One who did recently came in for help getting a job at Robins Air Force Base. Robinson-Moffett screened the alumna’s background to ensure she had the relevant experience, edited her resume and offered advice – then helped set up the interview. The woman got the job. Overwhelmed with gratitude, she sent Robinson-Moffett a spray of lilies and baby roses. Until the flowers wilted, they sat in a vase on Robinson-Moffett’s desk, a lovely symbol of the joy the experience brought to all involved. 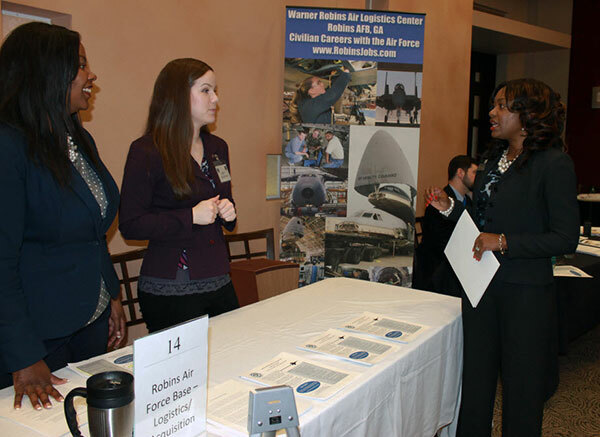 Photo: Dr. Melinda Robinson-Moffett, far right, talks to recruiters from Warner Robins Air Logistics Center during a recent career fair on the Cochran Campus. Photo by Sheron Smith. Career Ambassadors, students who need volunteer experiences and apply to Career Services to help with multiple projects, including assisting employers at career fairs. Click “Career Ambassadors” on the webpage. Career Assessments, which are tools to help individuals plan short-term and long-term career development goals and explore career options more closely aligned with their purpose/mission. Look under “Resources” on the webpage. Assistance developing resumes, setting up LinkedIn profiles and preparing for interviews. This article originally appeared in the Spring 2016 edition of Middle Georgia State Today magazine.